of the New Orleans Thieves Guild were also dedicated to the Old Kingdom, believing their line to be descendant from that society. Seizing the opportunity, Candra organized the Great Pact between the Thieves Guild and their enemies, the Assassins Guild, using the gifts of “the Power and the Life.” Candra provided the Thieves Guild with the Elixir of Life, a potion which gave them eternal youth, so long as they regularly received the components of the elixir from Candra. In this manner, they could continue their search for knowledge of the Old Kingdom beyond a single lifetime, and Candra could reap the benefits in time. Meanwhile, Candra used her abilities to unlock mutagenic potential in the Assassins Guild, providing them with the power to carry out their work. In exchange, they would serve Candra in her defense and as a deterrent for the Thieves if they ever thought to betray her. By standing above both Guilds like this, she became their Benefactress. She acquired the services of a mystic who became known as the Tithe Collector, moving between the guilds to collect the regular payments they made towards Candra for her generosity. Candra's pursuit for knowledge led her down other avenues as well. She learned of the existence of the Momentary Princess, a gemstone that appeared at regular intervals and provided a glimpse of the past and future to those who made contact with it. Unfortunately, Jacques LeBeau and his Thieves Guild failed to acquire the Princess for her in 1887. As a result, she withheld the Elixir of Life from the guild, causing them to age prematurely as they attempted to buy their way back into her favor. The Thieves were left dangling on the hook for four years, with no clear path provided for them by the Benefactress or the Tithe Collector to repair the Pact. In fact, Candra took Jacques' preadolescent son, Jean-Luc LeBeau, and Belize Marceaux, son of his harvest master, as collateral for ten months. The Tithe Collector eventually provided the Thieves Guild with a lead on a bounty to quell Candra's rage. They brought her the notes of Nathaniel Essex, a doctor and burgeoning geneticist whose work represented the future of the species. Instead of being appeased, Candra was furious and frightened, for she recognized the blueprints for Essex's advancements as the work of En Sabah Nur, the Eternal One, whom even the High Lords gave a wide berth. 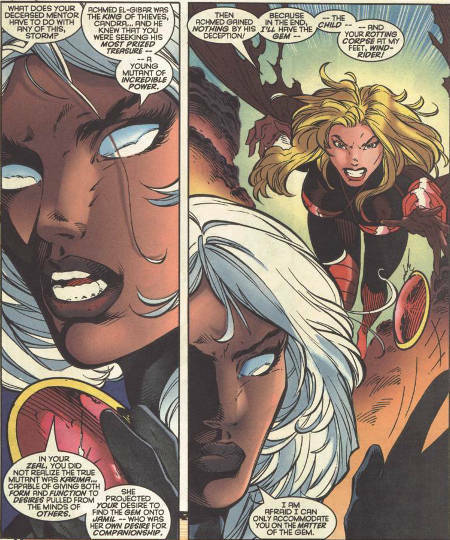 than she was with him, le Diable Blanc was prepared to assist her in acquiring Essex's technological advancements without alerting En Sabah Nur, in exchange for restoring the Pact. Out of pride, Jacques LeBeau rejected the stranger's aid, and so it became a race to seize the prize. In the years that followed, the thrill-seeking Candra became bored with the stagnation caused by the Pact. She wanted to liven things up again, dismantling her own power base in order to establish a new, more interesting state of affairs. To that end, she used the Elixir of Life to revive Julien as her wild card in the struggle between the Guilds. He formed an alliance with an ambitious Thief named Pierre, and they plotted to have both the Power and the Life, serving Candra in a new age while they disposed of the weak, older generation. of Life to restore her to health. 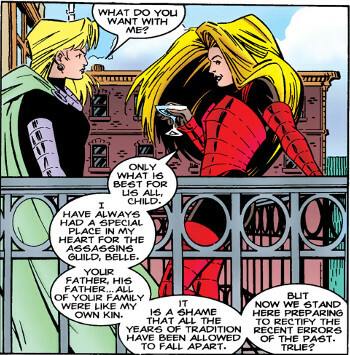 Jean-Luc sent him to Paris to meet with Candra, and Gambit learned for the first time that his old lover was actually the Benefactress. 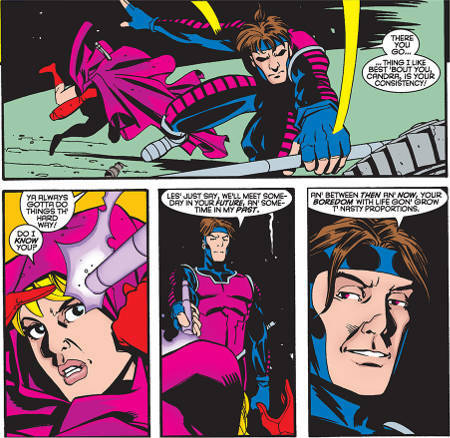 Playing games, Candra offered to give Gambit the Elixir of Life if he killed Jean-Luc for her, whom Candra had kidnapped. As Candra and the Tithe Collector entertained Gambit, Julien slipped his leash and attacked Candra directly to gain the Elixir of Life. Remy defended Candra from Julien, prompting her to return the favor and telekinetically expel the Assassin from her home. When he stole a kiss from her before departing with his father, however, Remy also swiped the missing element of the Elixir that Candra kept on her person. After this death, Candra's psychic essence remained, but untethered to a physical form. She learned how to slowly reconstitute herself, drawing upon the life energy released by other people as they died. To expedite her resurrection, Candra once again made contact with the Assassins Guild. More than a Benefactress, she became the Red Death, almost a patron goddess to the Assassins as they made sacrifices in her name, speeding her return with every killing. 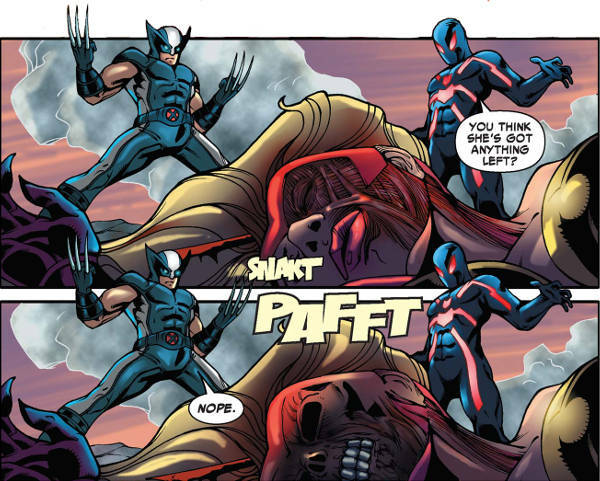 Belladonna hoped to blackmail Kaine, the Scarlet Spider, into killing Wolverine in the name of the Red Death, but instead they joined forces and came after the Assassins Guild, threatening the resurrection. through her telekinetic powers and the lifeforce she had acquired thanks to the Assassins. 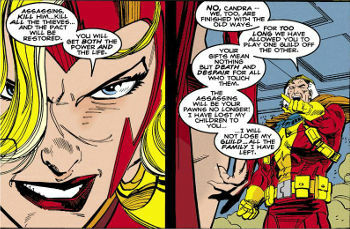 Still, she was powerful enough to threaten Wolverine and the Scarlet Spider. As they fought back, however, Candra was forced to exert her energies, tipping the scales back from life to death. As she accumulated more and more injuries fighting the two, Candra’s body became more and more unstable. Seeking easier prey, Candra turned on her own Assassins, killing many of them to rejuvenate herself further. In the Age of Apocalypse, Candra and the Externals had closer ties to En Sabah Nur as he began his public rise to power early. 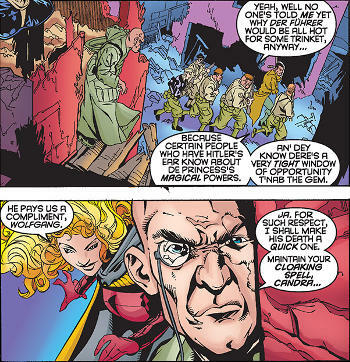 Candra and Gideon were among his earliest Horsemen, working with Sabretooth, War and Death in an attack on Cape Citadel. 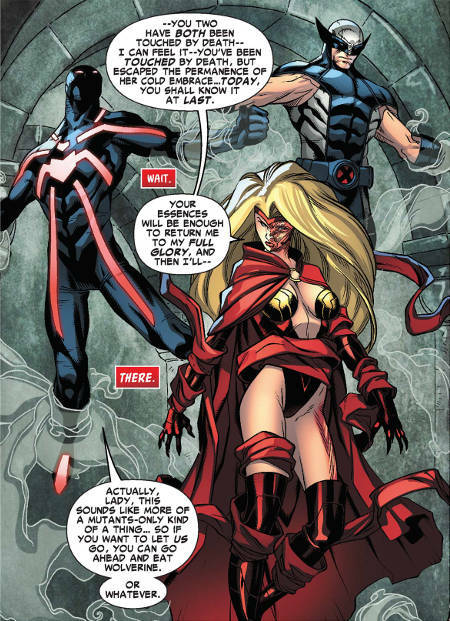 They fought against Magneto's original X-Men for possession of humanity's nuclear arsenal. As years passed, Apocalypse narrowed his Horsemen down to a traditional roster of four. 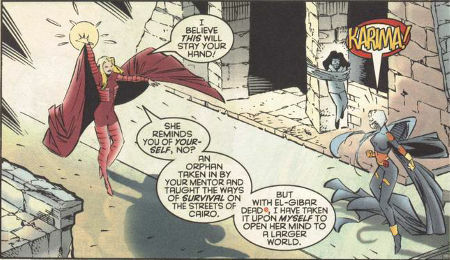 Candra was apparently killed by Apocalypse's own son Nemesis after he became Holocaust, securing his place among the most elite of Apocalypse's minions.